I don’t cook Ina Garten‘s recipes that often because they tend to be way too rich (says she who recently baked a cake with a few hundred calories per bite.. ;-)). But these muffins have just the right amount of indulgence, well balanced by all their healthy components: unprocessed bran, fruits, and nuts. I am always happy when I find a good recipe for bran muffins, Phil’s favorite ways to start the day: one of these babies, warmed up slightly in the oven, next to a steaming cup of cappuccino. Preheat the oven to 350 degrees F. Place paper liners into a muffin tin. Combine the bran and buttermilk and set aside. Cream the butter and sugar in the bowl of an electric mixer for about 5 minutes, until light and fluffy. With the mixer on low, add the eggs, one at a time. Scrape the bowl and then add the molasses, agave nectar, orange zest, and vanilla. (The mixture will look curdled.) Add the bran/buttermilk mixture and combine. In a separate bowl, sift together the flour, baking powder, baking soda, and salt. With the mixer on low speed, slowly add the flour mixture to the batter just until combined. Fold in the dried fruits, bananas and walnuts with a rubber spatula. Fill the muffin cups to the top and bake for 25 to 30 minutes, until a cake tester comes out clean. Comments: Most recipes of this type call for over-ripe bananas, all brown and mushy. In this recipe, Ina used bananas that were good enough to eat as a fruit, ripe, but not falling apart at all. I was a bit intrigued, but followed her lead. Verdict: not only it works, but it’s probably what makes these muffins quite special, the little morsels of concentrated banana flavor. Mmm… these muffins sound so yummy and hearty Sally. I like the addition of wheat bran to the AP flour and the molasses is a very interesting touch – do you use blackstrap? The buttermilk also sounds delicious… so many great things going on here! I’m with Phil – enjoy warmed up with a steaming cappuccino!! I love the use of molasses and orange. I bet these taste wonderful. I don’t like overly sweet muffins. 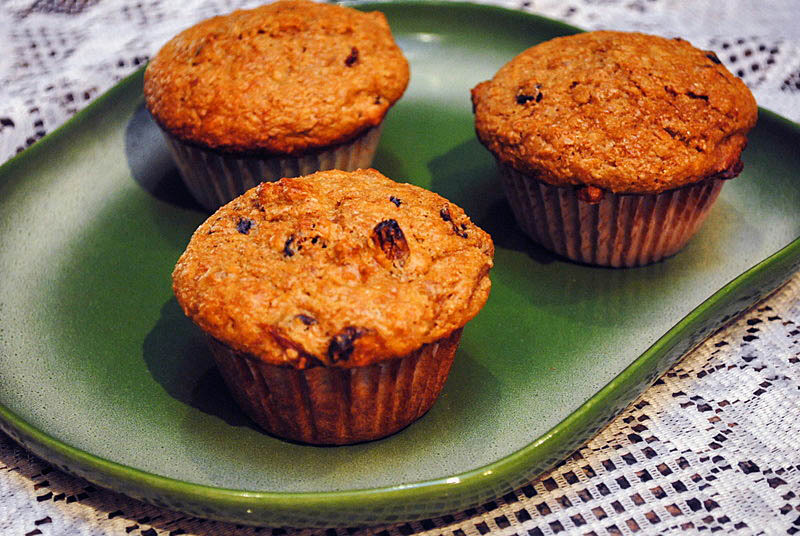 These muffins look tasty – and I like the use of fresher bananas. Yum! I have a banana bran muffin recipe but I think it’s going out the window as this one has more exciting stuff in it. Is it alomst a bit hummingbird cake like to eat? This is a healthy recipe for Ina! I like the idea of the not too mushy bananas too. Now, I wish I had some of these sitting here for breakfast this morning! I smiled to read that Phil approved of these! I too shy away from Ina’s baking, but love that lady and her recipes! This sounds like a wonderful, healthy breakfast treat and also something I could take on a bike ride. Thanks for stopping by my blog; I’m looking forward to visiting you often! perfect for bike rides indeed – bran muffins seem to hold their shape and take a lot more abuse than the regular, sweeter ones. The muffins look handsome, wholesome, and awsome. They are probably not going to please people into real sweet stuff, but even bran-haters might enjoy them. Lots of flavor, and moisture in these. This really was a healthy recipe for Ina. I’m always on the search for something to serve my health conscious guests in the morning. I think that they would really enjoy these and bran muffins have always been one of my favorites. Can’t wait to give this recipe a try. Healthy for Ina! That is so true…. she is a wonderful cook, but sometimes I think she should set an example and streamline her recipes a little. Nice! I like the orange and molasses as extra flavor components. The banana chunks are a great idea. Hi Sally! Made these yesterday, and I loved them! Best bran muffin I’ve had in ages, and, to me, it ranks right up there with the best muffins I’ve had with or without bran. Thanks for posting this. I used a combo of raisins and dried cranberries. Didn’t have any blueberries on hand. Left out the walnuts, as I have a picky, anti-nutter in the house. Funny thing is, I’m the only one in the house who liked them. The other three disliked exactly what I loved about them. Go figure! They didn’t like the chunky banana and the taste of the bran. I loved the chunky texture and can’t wait to add nuts and blueberries next time, since I’m the only one enjoying these babies. I think I’ll try a tropical mix of dried fruit next time.